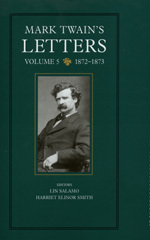 This volume is the fifth in the highly acclaimed edition of Mark Twain's Letters being prepared by the Mark Twain Project at the University of California, Berkeley. This edition, the only complete one ever attempted, includes all of the letters known to be extant. The 309 letters in this volume, most of them never before published, cover the years 1872 and 1873, during which Clemens established an international reputation and gained new self-confidence. His correspondents include many prominent men: Whitelaw Reid, William Dean Howells, John Hay, Thomas Nast, Joaquin Miller, George MacDonald, John Brown, Moncure Conway, Charles Dilke, and Lord Houghton, to name a few. The letters have been meticulously transcribed, either from the original manuscripts or from the most reliable sources now available. Thoroughly annotated and indexed, they are supplemented by genealogical charts, a transcription of the journals Clemens kept during his 1872 visit to England, book contracts, and over fifty contemporary photographs of Clemens, his family and friends, and original manuscripts. The letters and their annotations capture Clemens' activities in detailed intimacy, shedding new light on his acceptance into New York intellectual circles, London society, and, at home, Hartford's Nook Farm community of writers and progressive thinkers. For the Clemenses it was a period of fulfillment, although not untouched by tragedy. In March 1872 their first daughter, Susy, was born, and in June they lost their nineteen-month-old son, Langdon. With the royalties from Roughing It, Clemens' second full-length book, they purchased land, hired an architect, and made plans for the eccentric house they would live in for most of the next two decades. Clemens' reputation was enhanced by his profitable lecture appearances, and by his letters and articles in the press, in which Mark Twain the humorist revealed himself as both public advocate and a public conscience. He was confident enough in his literary powers to move in a new direction: away from humorous personal narrative and toward fiction. After beginning work on The Adventures of Tom Sawyer, he set it aside to collaborate, almost as a lark, on a novel with Charles Dudley Warner. After a few months of intense labor in the winter of 1872-1873, they produced The Gilded Age, which gave a lasting name to the era it satirized. The novel was hardly completed before Clemens set sail again for England, his second of three trips there during this two-year period, with his wife, child, nursemaid, and private secretary. On his first trip, in 1872, he had been amazed to find himself hailed everywhere as a literary lion. During his second trip, in 1873, his fame and popularity continued to grow. As his letters document in unmatched detail, he engaged in a dizzying round of sightseeing, speech-making, and socializing with literary and political lights, capping his visit with a triumphant London lecture debut. America's premier humorist had now begun his long tenure as an international celebrity. Lin Salamo and Harriet Smith are members of the Mark Twain Project in The Bancroft Library of the University of California, Berkeley. Salamo is coeditor of Mark Twain's Notebooks & Journals (1975, 1979), The Prince and the Pauper (1979), and the first, second, and fourth volumes of Mark Twain's Letters (1988, 1990, 1995). Smith is coeditor of the first and second volumes of Mark Twain's Letters (1988, 1990), and, with Salamo, of the award-winning Roughing It (1993). On his first trip to England to gather material for a book and cement relations with his newly authorized English publishers, Samuel Clemens was astounded to find himself hailed everywhere as a literary lion. America's premier humorist had begun his long tenure as an international celebrity. Meanwhile, he was coming into his full power at home. The Innocents Abroad continued to produce impressive royalties and his new book, Roughing It, was enjoying great popularity. In newspaper columns he appeared regularly as public advocate and conscience, speaking on issues as disparate as safety at sea and political corruption. Clemens's personal life at this time was for the most part fulfilling, although saddened by the loss of his nineteen-month-old son, Langdon, who died of diphtheria. Life in the Nook Farm community of writers and progressive thinkers and activists was proving to be all the Clemenses had hoped for. The 309 letters in this volume, more than half of them never before published, capture the events of these years with detailed intimacy. Thoroughly annotated and indexed, they are supplemented by genealogical charts of the Clemens and Langdon families, a transcription of the journals Clemens kept during his 1872 visit to England, book contracts, his preface to the English edition of The Gilded Age, contemporary photographs of family and friends, and a gathering of all newly discovered letters written between 1865 and 1871. This volume is the fifth in the only complete edition of Mark Twain's letters ever attempted, and the twenty-fourth in the comprehensive edition known as The Mark Twain Papers and Works of Mark Twain. Lin Salamo and Harriet Elinor Smith are editors with the Mark Twain Project in The Bancroft Library of the University of California at Berkeley. Editorial work for this volume was generously supported by the National Endowment for the Humanities and by donations to The Friends of The Bancroft Library from the Barkley Fund.